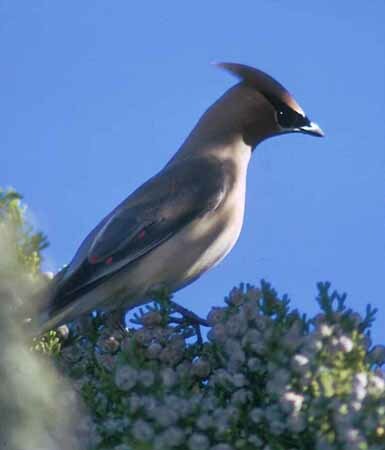 Photos: The Cedar Waxwing Bombycilla cedrorum photo at upper left was taken by John Butler in San Diego County, California, in Jan 1973; the two birds below it were part of a larger flock in Monterey in April 1999 (photo by D. Roberson). 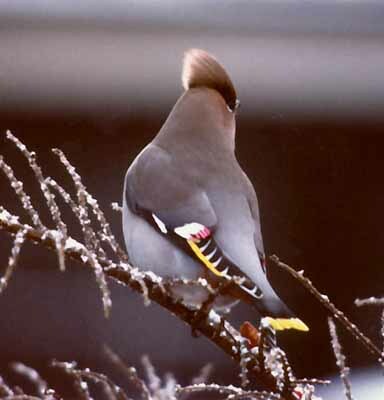 Graham Catley photographed the Bohemian Waxwing B. garrulus at Skegness, Lincolnshire, England, in Feb 1988. Photos © of the photographers listed, used with permission; all rights reserved.